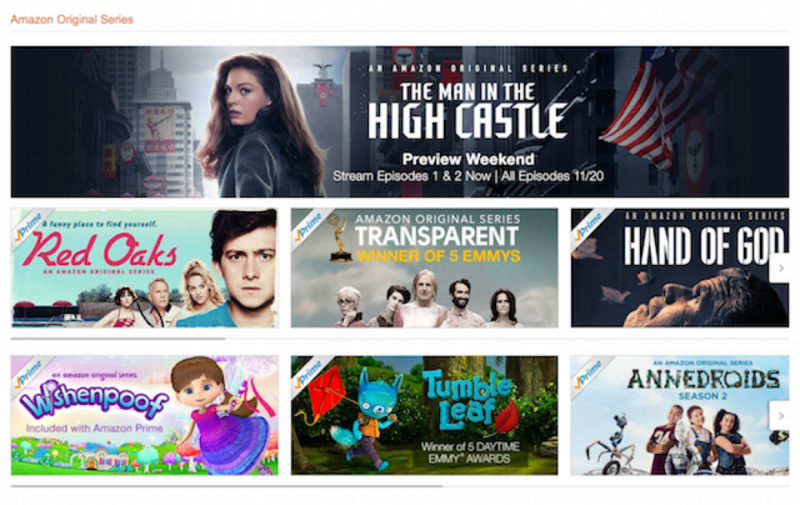 Streaming the Zeitgeist: Should Amazon offer Prime cuts instead of Netflix’s feast? At this moment in time, the volume of Netflix original content currently outnumbers Amazon’s own by approximately ten to one. On face value it would seem that the race is already won for Netflix, however if we look closer at Amazon’s service we can see a very different aim and strategy emerging from them. Firstly, it is important to establish the key differences between the two platforms. Netflix is a stand-alone company with all content available within the subscription. Conversely, Amazon Prime offers a similar range and amount of content to Netflix within the subscription but it is part of a bigger digital platform that offers a vast selection of digital titles for standard transactions. To return to the food analogy of this article’s headline, one could say that if Netflix is an all you can eat buffet, then Prime is a free salad bar. Also, Amazon Prime offers an alternative subscription for a slightly higher fee which includes the streaming service and free next day delivery, a huge incentive over Netflix’s self-contained service and has played a huge part in Amazon cutting Netflix’s lead in subscriber numbers. However, now it is debatably in their television production where the two will want to be more distinct from one another to not only attract and keep subscribers, but to also be able to co-exist on an individual’s devices. Since 2013, both platforms have been offering original content only available through their respective services and as the chart below demonstrates, the critical response to both services flagship shows has been very positive so far. While Netflix titles may dominate the list with seven entries, Prime’s Transparent is the second most acclaimed show and has also been laden with many awards that only Netflix’s House of Cards can equal. It is with this kind of stand-out programming where Amazon’s production focus may fall in the near future. With the Prime subscription potentially offering more value with the delivery service, it may not be necessary for it to offer the quantity of Netflix’s content to still remain appealing. By providing a more select amount of original programming, they obviously cut down on the overall production costs but can still retain the essential “must-see” nature of their service with highly praised shows such as Transparent and The Man in the High Castle. Of course, Amazon could try to compete by offering the same amount of original shows, but this could lead to a ‘tyranny of choice’ type of experience on the service and may mean customers are less likely to buy directly from the rest of their digital market place. Also, such an approach would not help with the real problem Amazon is currently having in competing with Netflix’s original programming. As both platforms are resistant to releasing viewing figures for their content, the best way we can build a picture of the audience numbers for original content is to use the shows’ social media followings. We can see in the graph above that Prime’s shows have built far smaller followings, while Netflix enjoys far bigger audiences that are key to keeping and attracting subscribers. 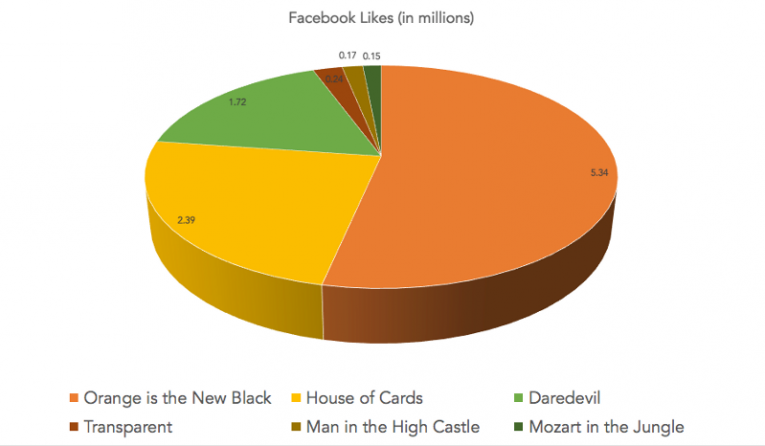 As the chart above demonstrates Transparent, Amazon’s most ‘liked’ original content, has only has a fraction of the following compared to Netflix’s such as Orange is the New Black, House of Cards or Daredevil. 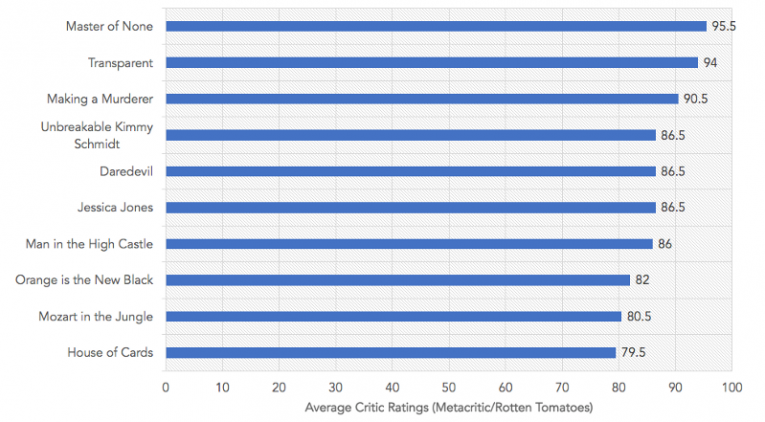 This again shows why quality over quantity should be Amazon’s main priority in releasing content to keep their premium programming in focus on social platforms, but also shows that critical acclaim is not the be all and end all for audience appeal with OITNB’s rating being 12 points beneath Transparent’s impressive overall review score. It’s also not as necessarily easy for Amazon to court the zeitgeist as it is for Netflix. Netflix has the luxury to court controversy and release edgy and radical shows such as OITNB since it won’t have further repercussions beyond the service itself. Prime, however, represents the world’s biggest online merchant and while causing a stir may help the platform itself gain attention and identity, it is not the in best interest of its parent company to be potentially offending/upsetting/shocking customers at large. Of course, controversy isn’t always a guarantee of a large audience and Amazon have arguably already cultivated a gentler aura around their shows. For example, Transparent’s exploration of LGBT issues is far subtler than OITNB’s more sensationalised depictions of the same subject. It’s this more delicate approach that separates Prime from its nosier rival and creates a more distinct option for audiences. Despite Prime’s Originals diminished online followings, the platform has been more pro-active in reaching out to audiences. Amazon have so far streamed pilots for over twenty new shows and received audience feedback by asking viewers to vote for the show they’d most like to see blossom into a full series. A throwback to the tried and tested network format it may be, but again it demonstrates a more careful approach from Prime in giving its audience what it wants without engaging in full blown productions of series that may or may not be appreciated by subscribers. And through such enterprises Amazon Prime could find key pieces of television to convince customers their shows have the same must see quality as Netflix’s, whilst being different enough in their approach and content to create space for themselves in a rapidly crowding marketplace in which co-existing with Netflix, rather than replacing them, must be the priority.